On Sunday I had lots of my close friends over for a Mother’s Blessing/ Blessingway. (Later on you will read why I am typing both “Mother’s Blessing AND Blessingway – there isn’t a simple word for it, folks.) These are an alternative to baby showers, inspired by rituals originating from several indigenous cultures that aim to prepare a woman for birth and motherhood. I went to my friend’s one a few months ago and was struck by the symbolism and meaningfulness of the activities. (And if you are wondering this is a big “hello there” from myself and womb-baby- still in one piece! Trying very hard to not spend all my time dwelling on what every little physical change means (“Ooh, lots of energy today- SIGN OF LABOUR! Oooh, feeling very tired- SIGN OF LABOUR!”) I’m instead focus on enjoying each day with Ramona, knowing that these are days to treasure, while I can pour all my love into her solely. For me, Sunday’s Mother’s Blessing was a beautiful, empowering experience. It almost felt like I was being ushered into birthing zone by my lovely group of friends, and I feel like I have a small hub of to support me on mystical hands as I labour. 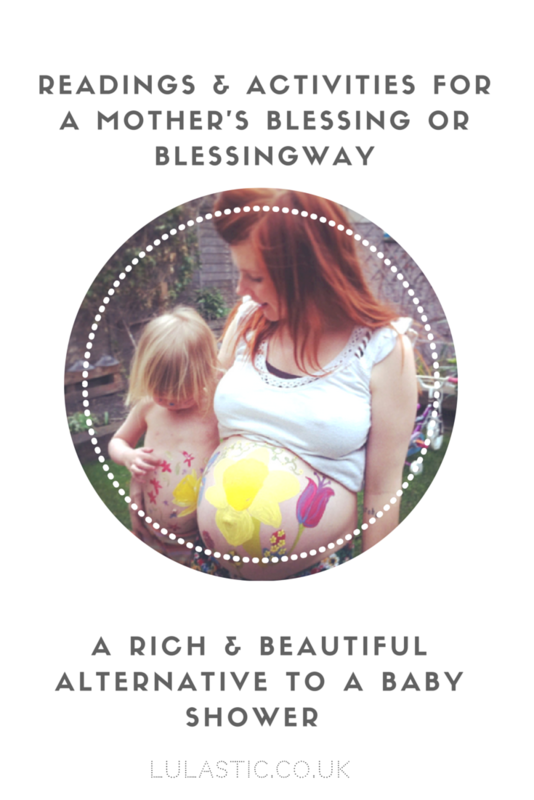 What is a Blessingway Ceremony or a Mother’s Blessing? The primary difference between a blessingway and a baby shower is that the focus is on the mother – it is a ceremony to mark the rite of passage she is about to go through. It is a time to honour the mother, to imbue her with strength from other women and to place her solidly in the community within which she stands. I was recently challenged by a fantastic piece in the Homebirth Aotearoa Magazine that spoke of how the use of a Blessingway could potentially be cultural appropriation. There seems to be a great wave of cultural appropriation happening everywhere at the moment, particularly lifting deeply embedded, thought out traditional practice from First Nations people. I believe we can be inspired by indigenous ritual – it is something that was probably once common to all of humankind but that a huge number of us have lost complete knowledge of. I believe it is important to draw on the wisdom of the indigenous communities still practicing today. However we must never commodify it, or use it tokenistically. If we are inspired by an indigenous practice we should look into it, read around it, seek to understand it and always acknowledge the culture we are inspired by. One way of ensuring that natural parents don’t just blindly copy-cat rich indigenous practice is to stop referring to these ceremonies as a Blessingway. Choose to call it a Mother’s Blessing. So from here on in this article I shall do just that! How to get a Mother’s Blessing off the ground? I emailed everyone in plenty of time, giving them a bit of a Mother’s Blessing explanation and asking them to bring a reading or prayer or poem, and also a bead. Obviously a person close to you could organise it too. My mum led things through, which was nice as she instills confidence and meant I didn’t have to think about things. We began with introductions and then we went around the room and each person told a little one sentence story about their mother or a woman that they are thankful for- some dads even came up. Some were based on qualities their parents have or family traditions, or the way another mother supported them in the early days. Then people threaded their beads onto a bracelet and as they did, either read their prayer/ poem/ reading or spoke about the meaning of their bead or something else they bought. The bracelet is for me to hold during birthing, to imagine the encouragement of this supportive clan. 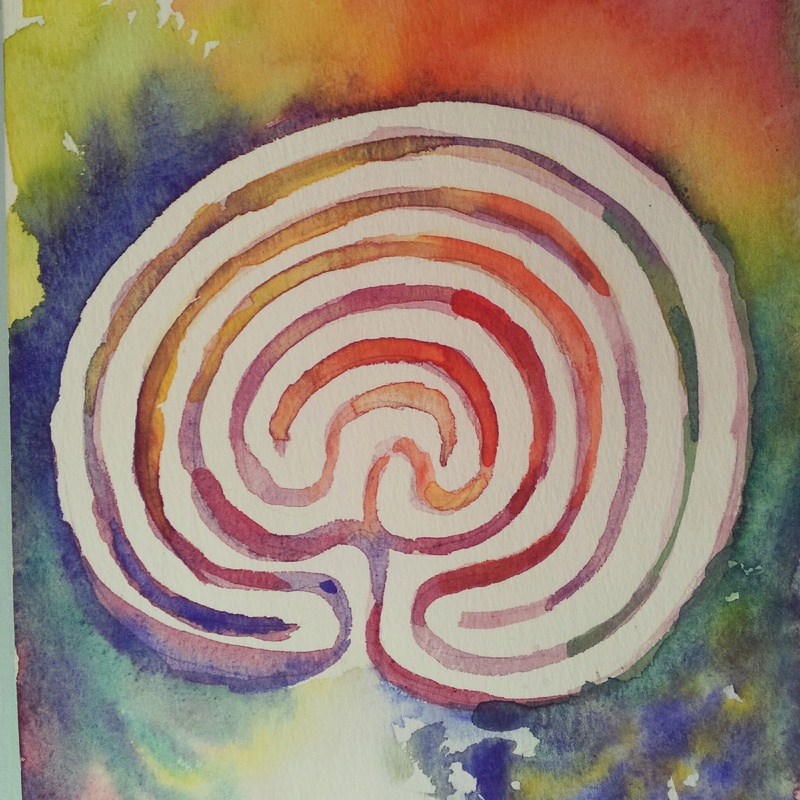 One friend bought some beautiful paintings she did, one of which is a labyrinth. She shared about how the labyrinth is a useful birth imagine. Once you are in there is only one way out, you cannot get lost. Sometimes it feels like you are on this journey towards the end, but sometimes it turns and you can get disheartened as it feels like you are not getting there! But you are always on the right path, padding away to the end. I love this imagery as it did really feel like this with Ramona! Mother’s Blessing/ Blessingway bracelets for all! As my mum played her contribution, a piece of music, I wound a thick thread around each woman’s wrist until we were all joined together. I then snipped and tied each one into a bracelet for my friends to wear and remember me as I labour. This symbolically recognises the circle of women form whom I draw strength. Why have a Mother’s Blessing? It is just a bit, well, deeper! It’s not very often I get to hear stories and take time out to creatively reflect with people- I guess our Englishness makes us a bit stiff-lipped or awkward. I really appreciated hearing these anecdotes and words of encouragement from these amazing women, people with all sorts of faith / spiritual persuasion (or none.) Even though what we were doing could have been a bit “heavy” or weird, it wasn’t like that at all, it just felt like a group of women being really open and reflective with each other. We then carried on eating lots of cake and bought out the paints and they painted spring onto my rotund tum! Henna on stomach instead of paint – and then all the women can be remembered during birth as it will still be there! 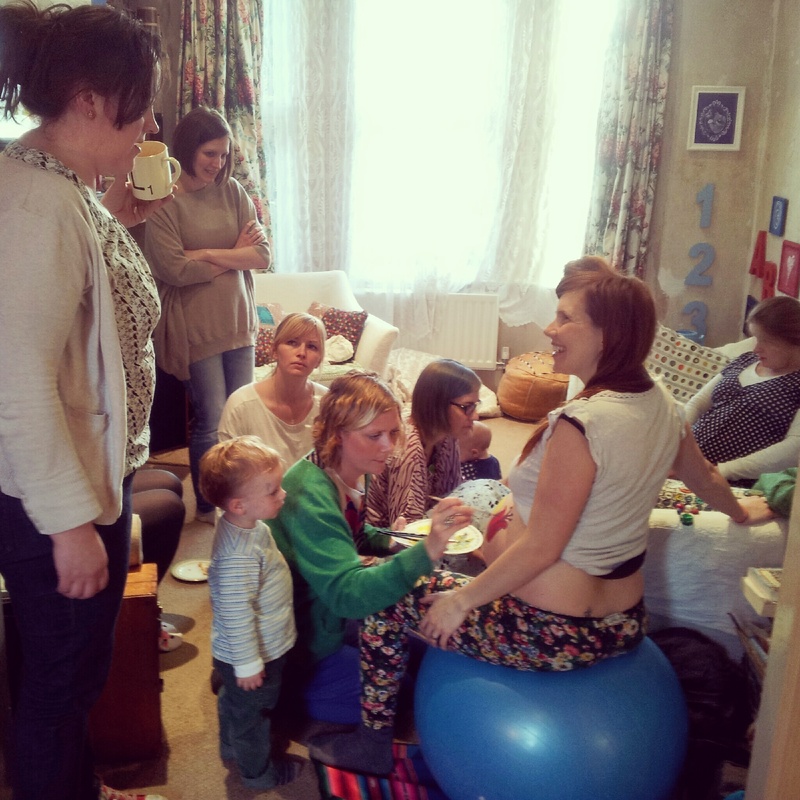 Taking a plaster of paris mold of the mothers bump- with each person applying the strips. The readings and prayers and poems that were read during my Mother’s Blessing…. the power of all creation. is a shout of joy. bless this our friend as she prepares for her journey. through storm and in sunshine. now, and in her journey’s ending. In the darkness something was happening at last. A voice had begun to sing. It was very far away and they found it hard to decide from what direction it was coming. Sometimes it seemed to come from all directions at once. Sometimes he almost thought it was coming out of the earth beneath them. Its lower notes were deep enough to be the voice of the earth herself. There were no words. There was hardly even a tune. But it was, beyond comparison, the most beautiful noise he had ever heard. It was so beautiful he could hardly bear it. Then two wonders happened at the same moment. One was that the voice was suddenly joined by other voices; more voices than you could possibly count. They were in harmony with it, but far higher up the scale: cold, tingling, silvery voices. The second wonder was that the blackness overhead, all at once, was blazing with stars. They didn’t come out gently one by one, as they do on a summer evening. One moment there had been nothing but darkness; next moment a thousand, thousand points of light leaped out – single stars, constellations, and planets, brighter and bigger than any in our world. There were no clouds. The new stars and the new voices began at exactly the same time. If you had seen and heard it, as they did, you would have felt quite certain that it was the stars themselves which were singing, and that it was the First Voice, the deep one, which had made them appear and made them sing. Far away, and down near the horizon, the sky began to turn grey. A light wind, very fresh, began to stir. The sky, in that one place, grew slowly and steadily paler. You could see shapes of hills standing up dark against it. All the time the Voice went on singing. The eastern sky changed from white to pink and from pink to gold. The Voice rose and rose, till all the air was shaking with it. And just as it swelled to the mightiest and most glorious sound it had yet produced, the sun arose. They had never seen such a sun. The sun above the ruins of Charn had looked older than ours: this looked younger. You could imagine that it laughed for joy as it came up. And as its beams shot across the land the travellers could see for the first time what sort of place they were in. It was a valley through which a broad, swift river wound its way, flowing eastward towards the sun. Southward there were mountains, northward there were lower hills. But it was a valley of mere earth, rock and water; there was not a tree, not a bush, not a blade of grass to be seen. The earth was of many colours: they were fresh, hot and vivid. They made you feel excited; until you saw the Singer himself, and then you forgot everything else. It was a Lion. Huge, shaggy, and bright, it stood facing the risen sun. Its mouth was wide open in song and it was about three hundred yards away. The Lion was pacing to and fro about that empty land and singing his new song. It was softer and more lilting than the song by which he had called up the stars and the sun; a gentle, rippling music. And as he walked and sang the valley grew green with grass. It spread out from the Lion like a pool. It ran up the sides of the little hills like a wave. In a few minutes it was creeping up the lower slopes of the distant mountains, making that young world every moment softer. The light wind could now be heard ruffling the grass. Soon there were other things besides grass. The higher slopes grew dark with heather. Patches of rougher and more bristling green appeared in the valley. All this time the Lion’s song, and his stately prowl, to and fro, backwards and forwards, was going on. She was finding the song more and more interesting because she thought she was beginning to see the connection between the music and the things that were happening. When a line of dark firs sprang up on a ridge about a hundred yards away she felt that they were connected with a series of deep, prolonged notes which the Lion had sung a second before. And when he burst into a rapid series of lighter notes she was not surprised to see primroses suddenly appearing in every direction. Thus, with an unspeakable thrill, she felt quite certain that all the things were coming (as she said) “out of the Lion’s head”. When you listened to his song you heard the things he was making up: when you looked round you, you saw them. This was so exciting that she had no time to be afraid. The Lion was singing still. But now the song had once more changed. It was more like what we should call a tune, but it was also far wilder. It made you want to run and jump and climb. It made you want to shout. It made you want to rush at other people and either hug them or fight them. Can you imagine a stretch of grassy land bubbling like water in a pot? For that is really the best description of what was happening. In all directions it was swelling into humps. They were of very different sizes, some no bigger than mole-hills, some as big as wheel-barrows, two the size of cottages. And the humps moved and swelled till they burst, and the crumbled earth poured out of them, and from each hump there came out an animal. The moles came out just as you might see a mole come out in England. The dogs came out, barking the moment their heads were free, and struggling as you’ve seen them do when they are getting through a narrow hole in a hedge. The stags were the queerest to watch, for of course the antlers came up a long time before the rest of them, so at first they thought they were trees. The frogs, who all came up near the river, went straight into it with a plop-plop and a loud croaking. The panthers, leopards and things of that sort, sat down at once to wash the loose earth off their hind quarters and then stood up against the trees to sharpen their front claws. Showers of birds came out of the trees. Butterflies fluttered. Bees got to work on the flowers as if they hadn’t a second to lose. But the greatest moment of all was when the biggest hump broke like a small earthquake and out came the sloping back, the large, wise head, and the four baggy-trousered legs of an elephant. And now you could hardly hear the song of the Lion; there was so much cawing, cooing, crowing, braying, neighing, baying, barking, lowing, bleating, and trumpeting. I must say, the “turn all this rubbish off” bit made me laugh! 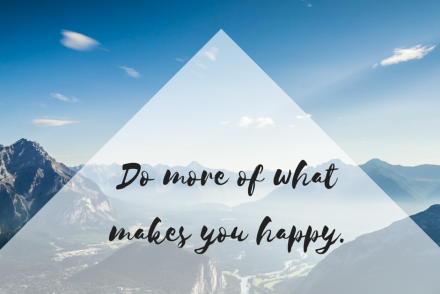 I spent a long time compiling some beautiful, motivational and relaxing music playlists to have on whilst I was in labour and after about an hour, I couldn’t bear it anymoe and screeched the exact same thing at my poor husband! 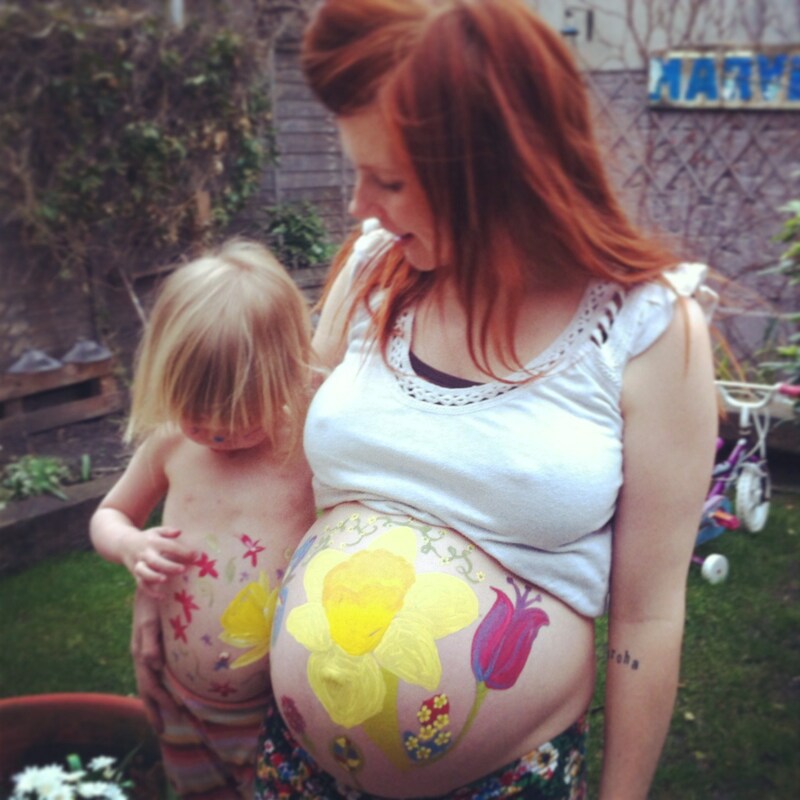 Aside from that, this was a totally beautiful post and I love the photo of your painted tummies! 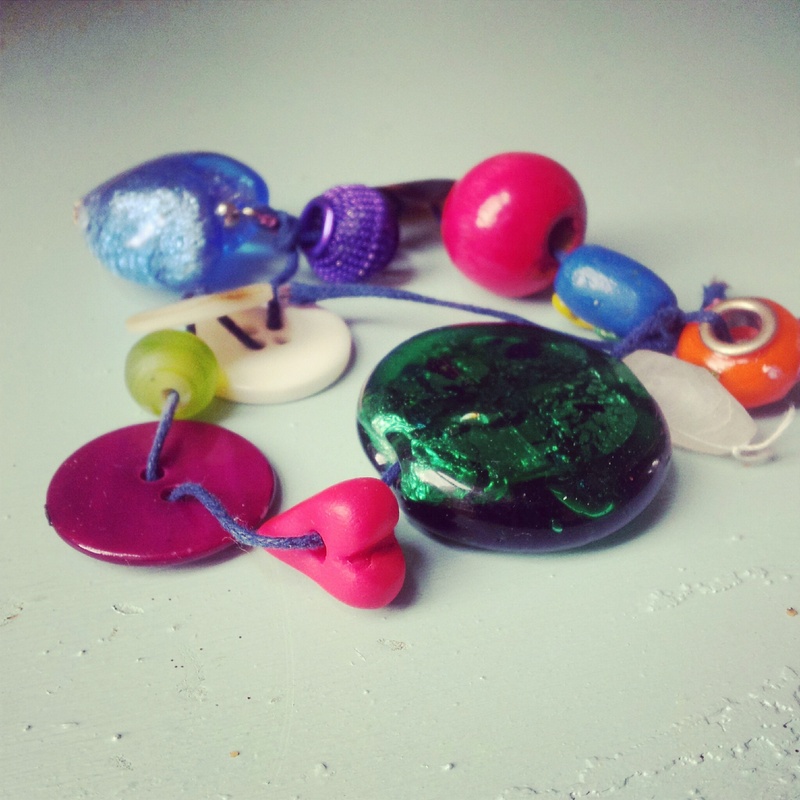 Victoria Naudi recently posted…One little smell…a million memories unleashed! Hi Lucy, so glad you had such a fun day with such good friends. I just wanted to tell you this – when I was pregnant with our second child I had this secret fear, that I could never, never love any child as much as my first, beloved child, and I grieved that this poor second baby would never have that love that I had for the first. I was so relieved to discover when she was put into my arms, and the other two in the years after her, that each child brought a wholly new, wholly individual relationship into the family, that I can love each one of them ‘the best’ in their own way..
Oh! What a beautiful comment! Lucy, you are obviously such kind and loving parents, you will help Ramona through anything… though lots of toddlers think ‘their’ babies are the most wonderful things ever. Make very sure you catch that moment when she first sees ‘her’ baby. It is amazing! And however she receives the baby at first, a sibling is such a gift. No one knows you like your big sister does. wha a beautiful way of spiritualism. I wish I had done some research! But I might have freaked the consultant out If I had done this upp north! Beautiful just beautiful! Love the painted tummy and loud and proud MUCOUS PLUG! I love the labrynth symbolism, that’s ace. I also love the painted stomachs, and the fact that there was cake. What else can you possibly need to prepare for a baby? Sounds like you had a lovely day with some lovely ladies. PS GET OUT WOMB BABY, WE ARE ALL WAITING TO MEET YOU. Ahem. Thanks for the wonderful ideas! I’m planning a blessingway on the beach for my sister next week, so have been planning this for a while now, but I haven’t come across any examples of readings/prayers to get inspiratik from, until now! THANK YOU!